What is a Cud Error on a Coin and What Does One Look like? A cud on a coin is a damaged area resembling a blob on the surface of a coin. The cud is raised above the field, and it obliterates the device or inscription where it appears. Cuds are the result of die cracks or die breaks which have become severe. They can also form from die chips where part of the die surface has become damaged and broken away. Some experts in the coin error-variety hobby insist that for the blob to be called a cud, the damaged part of the die must include part of the edge of the die. Although this is the purest definition, in common numismatic communications you'll see the term "cud" used to describe the blob created by any die chip or serious die crack, regardless of its placement on the die or coin. What Causes Cuds on a Coin? As a coin die continuously strikes coins in the coining press, the tremendous pressure used to mint coins causes stress on the metal coin die. Additionally, the friction on the surface of the die from striking the planchets causes the surface of the die to deteriorate. Combine these with a variety of other factors and a coin die can become damaged through normal usage. Eventually, all coin dies will deteriorate and fail in one way or another. Additionally, the metal collar that holds the planchet centered above the anvil die can sometimes move and get struck by the hammer die. If a die has been in the coining press for a while and has experienced the stresses of coining for a while, a piece of the die can break off. This breakage will leave a damaged coin die that will produce a cud. In the early years of the United States Mint coin dies were made by hand and were very expensive. Therefore, they were used in the coining press until they deteriorated or produced such low-quality coins that they were no longer deemed adequate to strike coins. Therefore, many early coins have cuds on them because the mint employees were trying to extend the life of the die for as long as possible. Modern minting processes allow coin dies to be mass-produced and they are significantly cheaper than the early coin dies of the United States Mint. 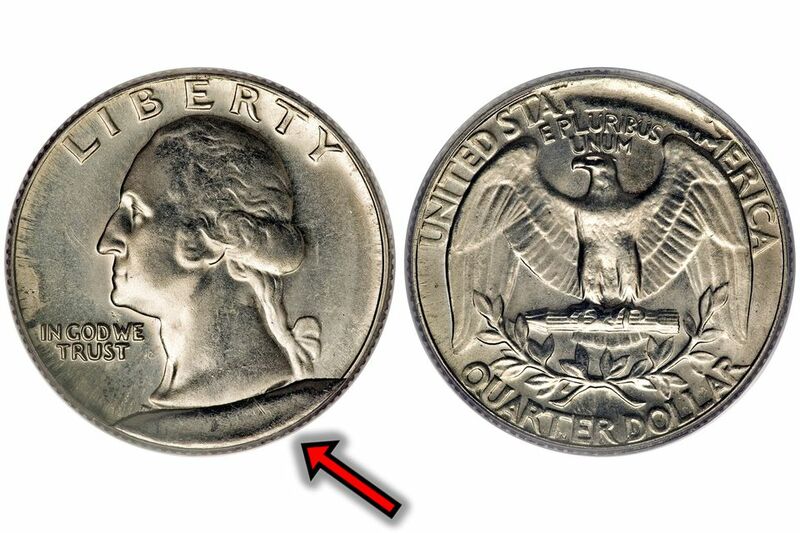 Therefore, at the first sign that a coin die is showing deterioration or stress cracks, the die will be retired in a new die used in its place. This improved quality process has resulted in fewer cuds appearing on modern coins. As a coin die begins to break, the piece of metal may not immediately separate from the coin die. The crack in the die will leave a ragged and raised defect on the surface of the coin. If the break extends from one edge to the other, it may start to work its way towards the outside of the coin before it detaches. This die defect will leave a weak image of the design on the cud. These retained die breaks leave the unique "fingerprint" on every coin it produces. Numismatic authenticator sometimes use these imperfections to identify genuine coins or to prove a coin is a counterfeit. How Much Is a Coin With a Cud Worth? Cud errors can be very valuable or detract from the value of a coin. Cud errors that are dramatic and can be seen by the naked eye will add more to the value of the coin. Small errors that need magnification to see can subtract from the value of the coin. Cud errors on Proof coins can be very valuable. Proof coins are the highest quality coins made by the United States Mint. The mint strikes each Proof coin multiple times and removes it from the coining press by hand. After the coin press operator removes the coin, it is inspected for defects. Coins that do not meet the high-quality standards of Proof coins are destroyed. If the error is due to a problem with the coin die, the coin die is removed from the press and replaced with a fresh pair of coin dies. Cud errors on Morgan silver dollars and Peace Silver dollars are cataloged and desirable by coin collectors. Numismatists Leroy C. Van Allen and A. George Mallis were the first coin collectors to research these die varieties and publish their findings. The term VAM derives from the first initials of Van Allen's and Mallis' last names.